A paper published today in Global and Planetary Change reconstructs droughts in North China over the past 250 years from 1760-2010 and finds droughts were much more severe and persistent in the past. Contrary to alarmist claims of increased man-made extreme weather and precipitation, the reconstruction shows extreme drought and precipitation was much more variable and extreme prior to the latter 20th century. According to the authors, the end of the reconstruction 2009–now is a "relatively wet" period. The authors find possible driving mechanisms to be the natural Asian summer monsoon and Pacific Decadal Oscillation, both of which have been linked to solar activity. 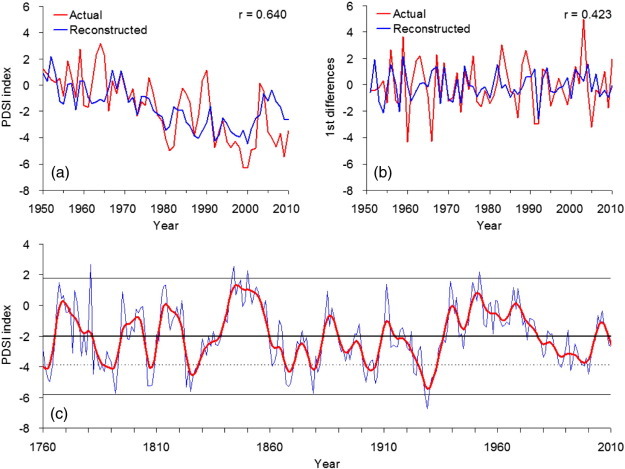 Palmer Drought Severity Index [PDSI] reconstruction from 1760-2010 shown in bottom graph. The end of the record 2009-2010 is according to the authors "a relatively wet period" in comparison to the past 250 years. Droughts and precipitation variability were much more extreme when CO2 levels were allegedly "safe." Note the PDSI is inversely related to drought - positive values indicate relatively wet periods, negative values indicate relatively dry/drought periods. Top graphs show good correlation between the reconstructed index and observed PDSI index. We have developed a 272-year ring-width chronology of Chinese pine (Pinus tabulaeformis) growing in the Huanglong Mountains, North China. Climatic response analyses revealed that mean January-July Palmer drought severity index (PDSI) has positive effect on the radial growth of pine trees. Based on the relationships, the mean January-July PDSI was reconstructed for the period from 1760 to 2010. The percentage of variance in the data explained by the reconstruction was 41% during the calibration period of 1950–2010. Spatial correlation analyses between the PDSI reconstruction and gridded PDSI data shows that the PDSI reconstruction captures regional drought variations over the environmentally-sensitive area linked to the East Asian summer monsoon. Relatively wet periods are identified for AD 1766–1781, 1795–1804, 1811–1821, 1838–1859, 1884–1889, 1909–1914, 1937–1977 and 2003–2008. Dry conditions prevailed during AD 1760–1765, 1782–1794, 1805–1810, 1822–1837, 1860–1883, 1890–1908, 1915–1936, 1978–2002 and 2009–now. There is a reasonable agreement with dry/wet periods previously estimated from tree-ring data of the Kongtong Mountains of the Loess Plateau. Spatial correlation analyses with sea surface temperature in the Pacific Ocean and tropical Indian Ocean indicated that the Asian summer monsoon circulations play a role in modulating drought variations in the study area whereas the effects of the Pacific Decadal Oscillation are relatively strong.